Opening an ice cream cone shop is an excellent entrepreneurial opportunity if you do it right. We provide a friendly, comprehensive guide to develop the business successfully. 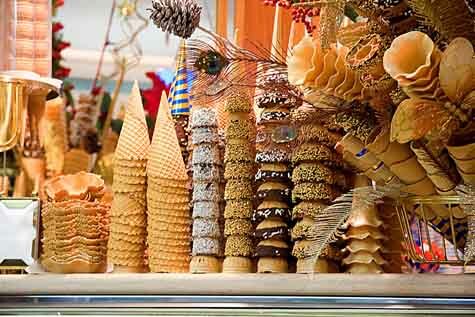 Wondering how to start an ice cream cone shop? We take you step-by-step from start to success. Location is everything in an ice cream cone shop. If your shop is located in an out of the way spot, it will be difficult to generate enough traffic to cover your overhead, let alone earn a profit. The most productive locations for ice cream cone shops are storefronts or stands near playgrounds, ballparks, rec centers and tourist areas. Unfortunately, these also tend to me the most desirable locations for many different types of businesses, so expect to encounter competition in your search for space. If there is no space available near your desired location, you have two choices: (1) Delay your launch until space opens up or (2) Settle for a location a little farther away, but still situated on a main thoroughfare with high levels of foot and/or vehicle traffic. Since ice cream cone shops are food service businesses, you'll need to navigate many of the same health and safety regulations as a full-scale restaurant startup. Research local and state health codes early, and plan ahead to make sure you have enough time to correct violations that arise during your health inspection so you can stay on schedule for your launch. Another important launch detail is the completion of health and safety training for your workers prior to launch. Even though your shop may only be serving ice cream, unsanitary work practices can result in contaminated products and health risks. And these days, a single incident can generate tons of negative word of mouth as word filters out to the community through social media. In general, ice cream cone shops serve a limited number of ice cream flavors and use toppings to provide customers with the variety they crave. Why? Because toppings stay fresh for a longer period of time and are a much more cost-effective way of delivering diversity and value to customers. Other best practices may apply to your startup. In addition to constantly learning about the best practices in business leadership, we recommend that new ice cream cone shop owners research industry best practices by contacting successful (and not so successful) ice cream cone shops outside their target market to learn what works in today's ice cream cone marketplace. Although it might seem like an unnecessary formality, your ice cream cone shop's business plan is a document that will shape your goals and strategies on a go-forward basis. How many potential customers will be within a fifteen-minute drive of your business? How many will be within an hour's drive of your business? It's important to run the numbers to understand how many customers might be interested in doing business with your local ice cream cone shop. Before you open an ice cream cone shop in your area, it's essential to see how you will fit in the competitive landscape. We've provided the link below to help you generate a list of competitors near you. After clicking on the link, type in your city, state and zip code to get a list of ice cream cone shops near you. As part of your due diligence on opening an ice cream cone shop, it's a wise move to speak with somebody who is already in the business. If you think owners of nearby ice cream cone shops will give you advice, think again. The last thing they want to do is help you to be a better competitor. However, a fellow entrepreneur who has started an ice cream cone shop in a different city will be much more likely to talk with you, as long as they don't view you as a competitive threat. Many business owners are happy to give advice to new entrepreneurs If you are persistent, you can find a business mentor who is willing to help you out. Do you know how to find an entrepreneur who is running an ice cream cone shop in a different locale who can assist you? Unfortunately, many inexperienced ice cream cone shop entrepreneurs approach ownership with the mistaken idea that a startup is their only option when they could also pursue a business acquisition. Unless you have compelling reasons to launch a new business, buying an existing ice cream cone shop may be the better choice. An acquired ice cream cone shop is a known quantity; a startup is less certain because its forecasts depend on estimated outcomes. If you're diligent about finding the right acquisition prospect, you may be able to leverage a business buying strategy to rapidly propel yourself into a position of industry leadership. To protect your investment, it's worth considering the possibility of starting a franchise. Franchises streamline the startup process and enable inexperienced entrepreneurs to avoid many of the pitfalls that plague failed startups. In general, franchise startups have higher first-year success rates than traditional business startups. The below link will take you to our ice cream franchise directory where you can explore ice cream cone shop franchise opportunities from the industry's leading franchisors. Did this article answer your questions about how to open an ice cream cone shop? This site for small business owners and entrepreneurs greatly appreciates your feedback. Already Own an Ice Cream Cone Shop? Do You Sell to Ice Cream Cone Shops?